Jementah Hokkien Association in Jementah, Segamat, Johor. Southern Malaysia Hokkien (simplified Chinese: 南马福建话; traditional Chinese: 南馬福建話; pinyin: Nán Mǎ Fújiànhuà; Pe̍h-ōe-jī: Lâm-Má Hok-kiàn-oē) is a local variant of the Min Nan Chinese variety spoken in Central and Southern Peninsular Malaysia as well as in the Eastern Malaysian state of Sarawak. (Klang, Melaka, Muar, Tangkak, Segamat, Batu Pahat, Pontian, Johor Bahru and Kuching), Singapore, Riau and Riau Islands. This dialect is based on the Quanzhou dialect. It is markedly distinct from Penang Hokkien and Medan Hokkien, which are based on Zhangzhou dialect. Similar to the situation in Singapore, the term Hokkien is generally the used by the Chinese in South-east Asia to refer Min Nan Chinese (闽南语). Southern Malaysia Hokkien is based on Quanzhou dialect with some influence from Amoy dialect. 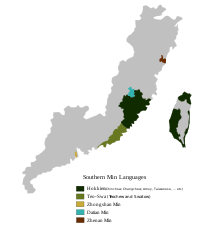 Southern Malaysia Hokkien is also subjected to influence from various languages or dialects spoken in Malaysia. This is influenced to a certain degree by Teochew dialect and is sometimes being regarded to be a combined Hokkien-Teochew speech (especially in Muar, Batu Pahat, Pontian and Johor Bahru). It has many loan words from Malay and English. This page was last edited on 27 December 2018, at 15:25 (UTC).